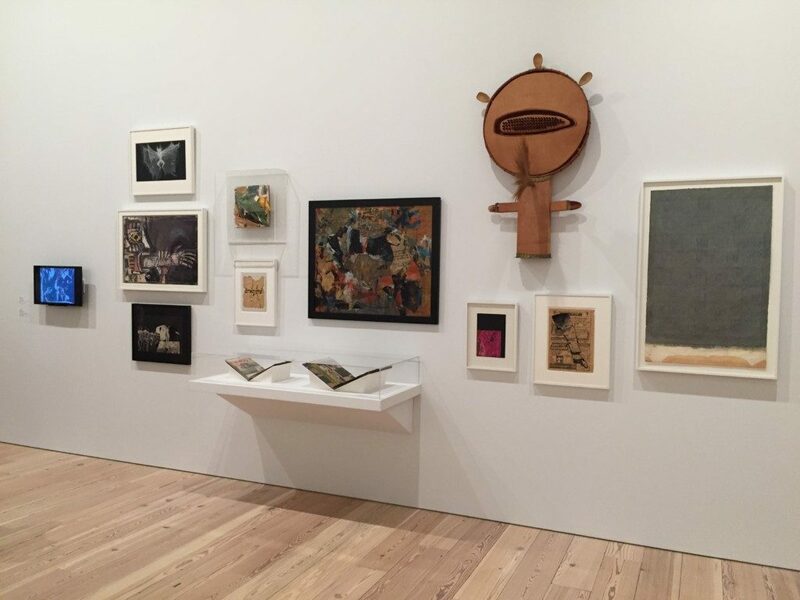 Middleton often referred to his work as “an improvised solo,” and the presence of his singular (for example, only and outstanding) Out Chorus in the celebratory 2015 Whitney Museum exhibition is ironic and bittersweet. It perhaps sums up the relationship the artist had with America and that which mainstream American museums had with his oeuvre: hard to see. Out Chorus was made in Madrid, where it was first exhibited before being shown in New York City at the gallery Contemporary Arts (fig. 1).3 In America Is Hard to See, it appeared on the sixth floor in the thematic section “Scotch Tape” (named after Jack Smith’s 1959–62 film), with artwork that displayed “extensive use of nontraditional materials, often scavenged in junk shops and along city streets.”4 For Middleton, who used Elmer’s Glue, collage was quintessentially and formatively European, and his own collage paintings are expressions of the internationalist, indeed democratic, imprint he achieved by leaving the United States. As he wrote, “the artist is, like a human mirror, reflecting ideas, images, feelings and the impressions of his environment as he sees and feels them. 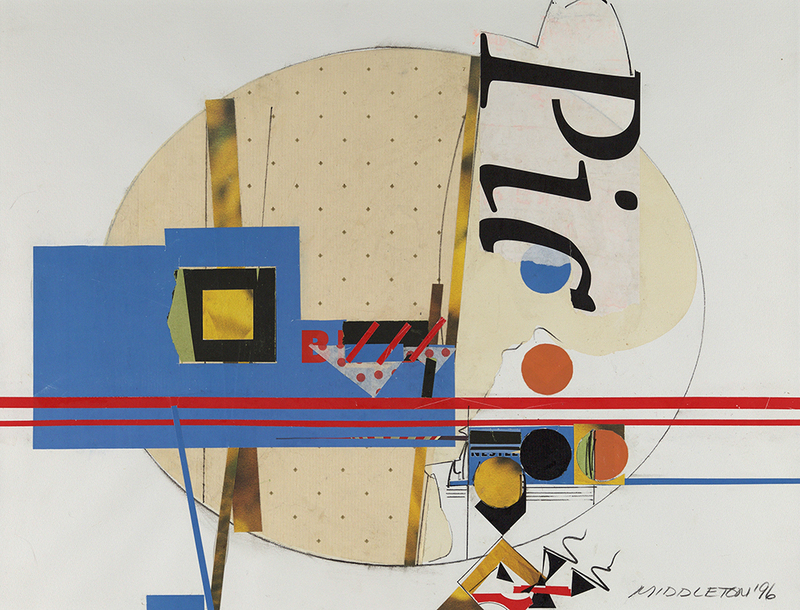 In this sense collage is a chain of connecting ideas and expressions like fragments of that broken mirror, gathered and mended.”5 Developing his artistry while living abroad, Middleton would position his work in prevailing canonical artistic traditions of twentieth-century European modernism, particularly the innovation and creative experimentation inherent to collage. Many black artists, including musicians, writers, and dancers, took up residence in Europe after World War II, for study or to live on a semipermanent basis. Paris, Amsterdam, Copenhagen, and Stockholm were lively hubs, and all attracted Middleton. 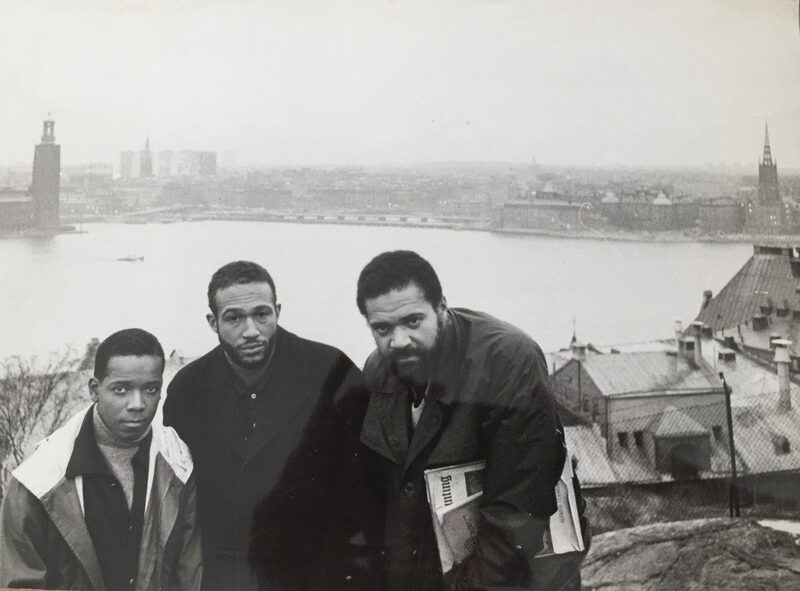 He found camaraderie and exhibition opportunities with African American artists living abroad, and through personal correspondence they kept each other informed of the American and international art scenes (fig. 2). Between 1959 and 1961, Middleton lived, worked, and exhibited in Spain, Sweden, and Denmark. “I was traveling around like a gypsy, carrying a suitcase full of newspaper scraps, cards and other bits of paper.”15 Collage painting was becoming his primary mode of expression, and the ephemera of his travels—ticket and transport forms, old newspapers—his media. 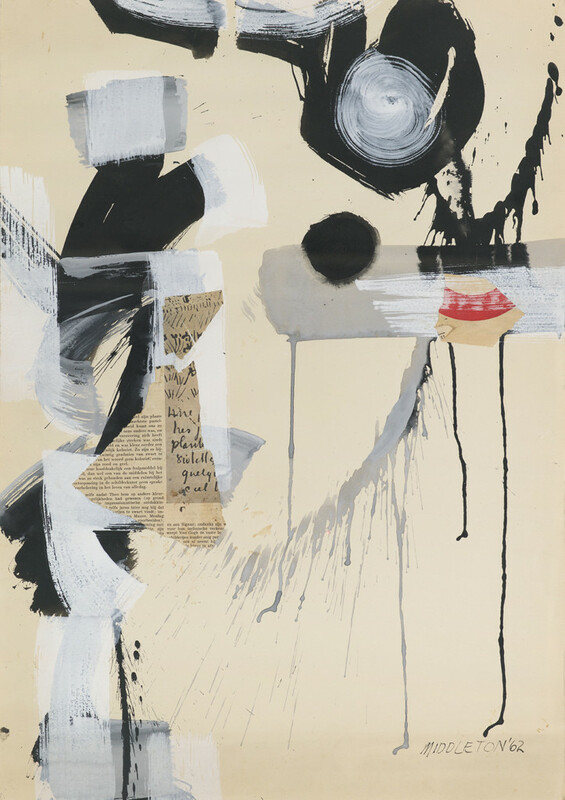 Active formally, these collage elements are metaphors for movement and cultural exchange, yet their once-inherent temporal and spatial relationships are reconfigured within Middleton’s compositions. 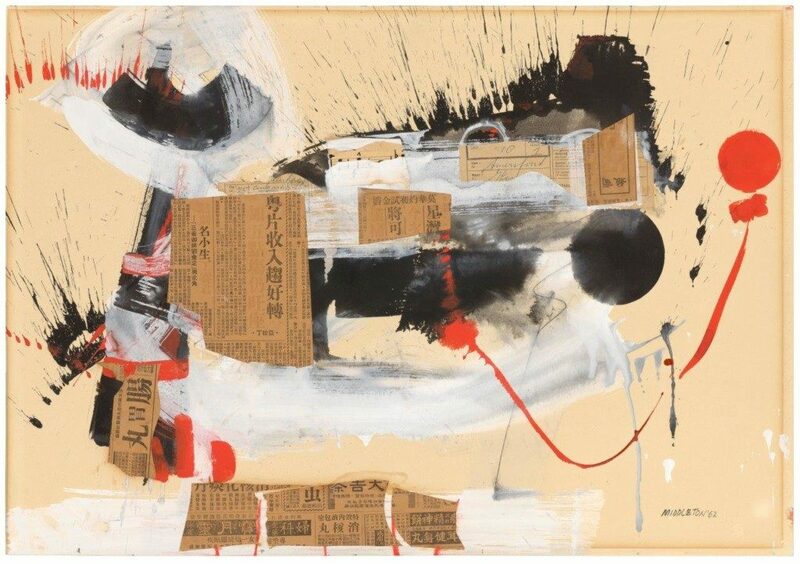 In later paintings, his collage materials include postage stamps, concert bills, musical scores, and paper miscellany, some sent by friends to the artist, as well as outdated glossy magazines he collected. Among his favored materials were thick billboard posters he would reclaim and then clean and flatten in his studio through a process of water immersion. Beyond the visual absorption of the arts and his environs, Middleton took a serious interest in art history. While in Stockholm, he worked on a treatise about collage, tracing its early history from Pablo Picasso, Georges Braque, and papier collé to something he called “Collaborations,” collage with paint or any fluid color medium—his beloved combination.18 Cubism, Surrealism, and Dada are discussed, and noted artists include Marcel Duchamp, Francis Picabia, May Ray, Hans Arp, and Max Ernst. 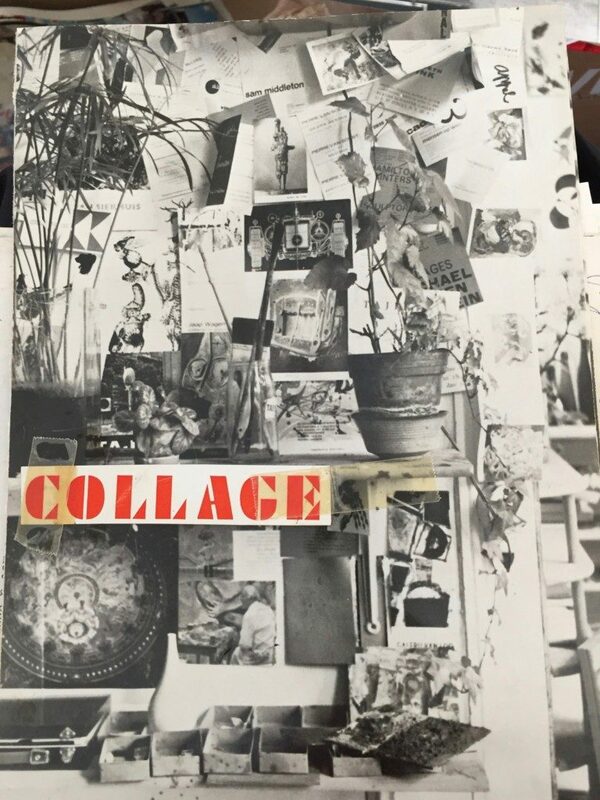 The manuscript, with reference notes and call-outs for illustrations, is methodical and differs markedly from the poetry and unpunctuated prose he also wrote about collage. “In the Beginning,” the first of eight sections, commences with Picasso, a figure “responsible for the challenge that is the concept MODERN . . . and today is still among the most creatively challenging artists working. Modern Art, therefore should always leave a place for him, for it can scar[c]ely ignore Picasso without negating all we know as Modern in Art.”19 Middleton’s written expression throughout the twenty-one typed pages is keenly observational and somewhat technical; first-person interjections are infrequent and appear mostly at the end of sections. The essay, in effect, positions Middleton’s collage paintings in the tradition of the “concept MODERN” with a rationale for “the authenticity of Collage as a true and sincere means of expression and therefore a worthy contribution to the annals of contemporary Art.”20 If the modernist narrative of invention and impudence that informs the essay is Eurocentric and male dominated, it was not qualified in this manner by the author. For Middleton, art had certain universal qualities, but in practice its deliverables were quite individual. Middleton’s acceptance into the Dutch art world was quick, facilitated by friendships with American sculptor Shinkichi Tajiri (1923–2009), active in the CoBrA movement, and Dutch painter Jef Diederen (1920–2009), who like Tajiri worked in abstraction. His work was associated with Dutch Pop Art in the 1960s, and both he and Gustave Asselbergs (1938–1967) were considered the principal proponents of collage art in the Netherlands.22 By 1964, the date of Social Realism (fig. 5), Middleton had received several solo exhibitions in the Netherlands.23 Benno Premsela (1920–1997), a leading figure in Dutch interior design, assisted with his exhibition installations and secured Middleton’s commissioned Bijenkorf department store windows showcases.24 Among the renowned Dutch graphic designers that Middleton worked with for his publications were Juriaan Schrofer (1926–1990) and Wim Crouwel (b. 1928), both of the multidisciplinary, modernist design studio Total Design, established in Amsterdam in 1963. The geometric, grid-based typefaces developed in the Netherlands were the perfect complement for Middleton’s improvisational aesthetics of the 1960s. 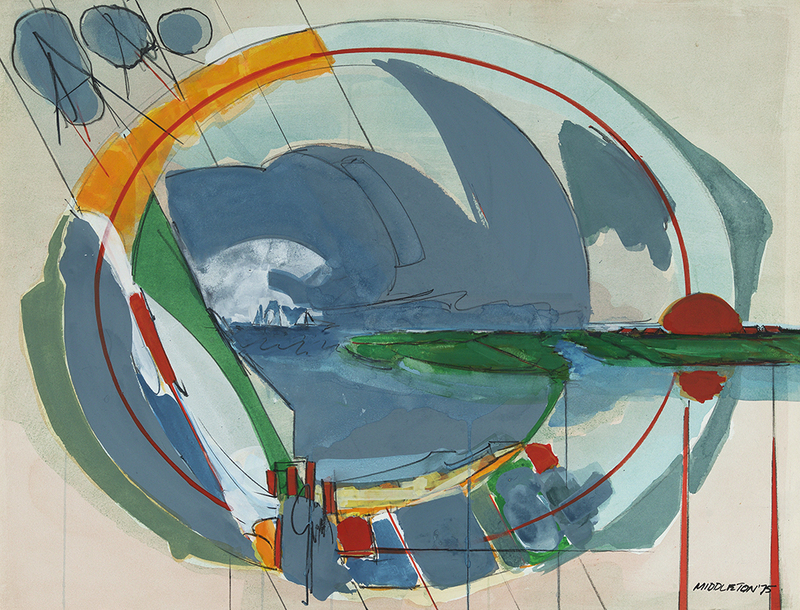 Two of the illustrated collages, Bells (1966; Amsterdam collection) and For Don Cherry (1966; artist’s collection) are round (50 cm [19 3/4 in.] in diameter), a favored geometric shape and emblem for Middleton. The circular, sometimes oval, shape represents, as he claimed, “‘the circle of life, of everything that goes around comes around. I interrupt it because I don’t want to go back to Harlem.’”28 In his treatise, Middleton likened collage to a mended mirror, and in Round Poem to Collage, the artist is collage. The little we know about his early New York years is framed by his recollections and tinged with deep melancholy and intermittent bliss. Middleton’s Harlem was oppressive, a place he described as suffocating—a chokehold—from which he needed to escape. Music was his escape, a conduit for joy—which he found in his youth at the Savoy Ballroom, where he perched on the fire escape to hear jazz bands rehearsing. Middleton’s “Round Poem to Collage” echoes concepts found in his collage treatise, but without punctuation the words resist fixed readings, not unlike his collage paintings: “a bit like memory in patches of objects and things idea and this inner image we see quest and hesitations is the driving force for all art which is without doubt very personal image strange but . . .”34 Readers may follow the text from any entry point, infer punctuation, and stop and start at will. Coherence is subjective. I suggest: Strange but. Art which is without doubt. Very personal image. Collage is art. Art is. I am. Sam Middleton: those closest to him understood that his art was truly a collaboration of his young life in America, extended by memory through jazz music in particular, and a long and productive creative life in Europe, notably the Netherlands. This is not hard to see when one stops looking for what is expected. In 1963, the Dutch writer Gerrit Kouwenaar compared Middleton’s work with the poetics of American sculptor Shinkichi Tajiri, the Italian painter Afro Basaldella (1912–1976), and the Dutch painter and poet of the CoBrA movement, Lucebert (1924–1994).35 Nearly ten years later, in 1972, Romare Bearden noted: “It is interesting that Mr. Middleton, who came to Europe a decade ago and who has lived, for the most part, in a city whose people and locales were depicted so well by Rembrandt, still retains at the core of his art a way common to his origins.”36 Assessments of Middleton’s art often served the needs of the reviewers: some considered the art in relation to the artist’s contemporaries while others filtered the reception through oblique references to Middleton’s nationality and race. Equally influential were political events in Europe and the United States and trends in European and American art discourse. Parsing this history is a necessary step in a retrospective examination of his career. Principally self-taught, Middleton’s list of “great inspirations” cleaves to no nation, genre, or profession. Among the many noted by the artist are Robert Schumann, George Gershwin, Josephine Baker, Paul Robeson, Wassily Kandinsky, Miles Davis, Emile Nolde, Charlie Parker, Marian Anderson, Mstislav Rostropovich, Noel Coward, Igor Stravinsky, Robert Motherwell, Franz Kline, Louis Armstrong, John Coltrane, and Thelonious Monk.37 When he was really jammed, he turned to the music of Johann Sebastian Bach. But Middleton’s art was inflected by location—inhabitants, history, geometry, architecture, and color—something he understood and used well. By 1972, Middleton had acquired a farmhouse in Oterleek, North Holland, and the imprint of the flat polder landscape and nearby North Sea provided considerable inspiration for the artist. Watercolor and gouache became the dominant medium for these verdant Dutch land- and seascapes as Middleton worked to capture the sublime qualities of stillness, wind, polder, and sea and the thrill of fresh color: a new blue in particular. 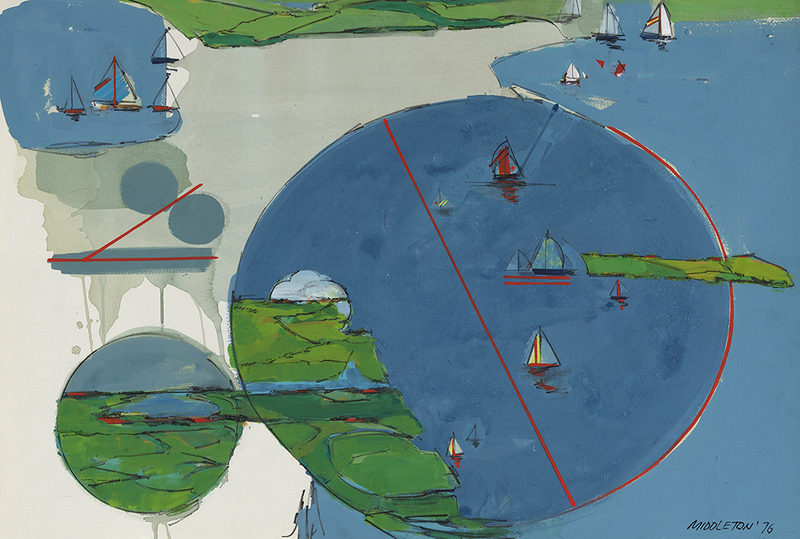 Some are populated with drifting sailboats, soaring gulls, and intersecting ovals and circles, such as Summer Wind (fig. 7). Their graceful orchestration and structured repose recall the work of abstract painter Richard Diebenkorn, admired by Middleton. In Everyone’s Music Book (fig. 8), polder, sea, and sky are abstracted into shifting color forms that intersect the circular lines that enclose them. Quintessential Middleton vectors, the articulated geometry of diagonal lines, ovals, and semicircles, were not new elements for Middleton, but the melody expressed in these Oterleek works was. In the Netherlands, Middleton encountered a tradition of painting steeped in the fundamentals of geometry, echoed by its land and architecture, all of which he absorbed and repurposed for his compositional structure. In the studied attention to the light, color, and geometry of his environs, he worked in the tradition of Jacob van Ruisdael, Johannes Vermeer, and Rembrandt van Rijn, and he maintained his singular voice. In a 1974 letter to Romare Bearden, Middleton inquired if he had yet to make art at his new home and studio in St. Maarten, noting: “History has such an obvious influence in the mentality, pride and character of a place and its inhabitants. . . . I can tell you there are some traits, color and expressions that are strictly and def[i]nitely Dutch. They could not ever be Italian, French or Scand[i]navian. Each is individual and so is Art and the artist.”38 Today we can travel a virtual world instantaneously; Middleton reminds us to consider the place-bound nature of aesthetics, including those attributed to a “European” canon. 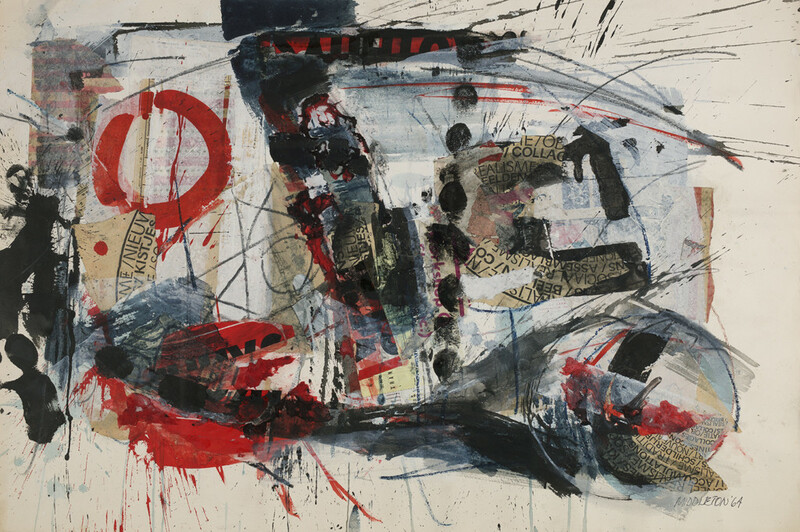 Middleton’s signature style was marvelously generative, not repetitive, and exemplary of his own commentary that “collage is a chain of connecting ideas and expressions.” His 1960s treatise on early collage reappears in Table Top Still Life from 1996 (fig. 9) as a clever visual lesson. Compositional antecedents abound in his oeuvre and that of others, such as Picasso’s legendary oval collage, Still Life with Chair Caning (1912; Musée Picasso, Paris). Indeed, Picasso’s collage was one of the works he discussed early and planned to illustrate in the treatise. It validated the use of “foreign materials” for paintings. “Though a small experiment,” Middleton wrote, it “launched a new concept of textual inconsistencies which were arranged so that a new unity was formed.”39 While Table Top Still Life seems to wink at Synthetic Cubism, Piet Mondrian, and de Stijl, it displays the delight with which the artist played with art history. Printed materials listing artistic genres in Dutch, including sociaal realisme, are the most recognizable components in Social Realism (fig. 5), and Dutch text on van Gogh appears in Cymbals (fig. 3). Middleton marked his place in the history of art. Alongside these artistic traditions, he accepted the gifts that the Netherlands provided: opportunity, professional recognition, a new vocabulary and language, and a vast sky and quality of light he had found nowhere else—all essential for his work. In Holland, he had the freedom to be an American artist, one who used Elmer’s Glue. Cite this article: Julie L. McGee, “Sam Middleton: Freedom’s Song” in “Riff: African American Artists and the European Canon,” Panorama: Journal of the Association of Historians of American Art 4, no. 1 (Spring 2018), https://doi.org/10.24926/24716839.1628. About the Author(s): Julie L. McGee is Associate Professor in the Department of Africana Studies and Art History and Associate Director of the Interdisciplinary Humanities Research Center at the University of Delaware.